The 2009-W $10 Sarah Polk First Spouse Gold Uncirculated Coin honors the wife of the eleventh President of the United States. Married to James Polk, Sarah Polk was considered very well-educated and a trusted advisor to her husband while he was in office. In fact, she served as his private secretary, the only First Spouse ever to work in that capacity. Coins in the series are all struck from 1/2 ounce of 24-karat gold and honor the spouses of the former Presidents of the United States. Normally, the US Mint only releases four Spouse Coins per year in association with the four Presidential $1 Coins released annually. However, as John Tyler had two different wives while in office, both spouses were honored on separate coins. 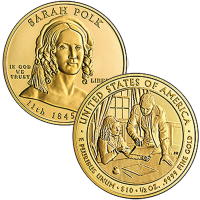 Struck to Uncirculated Quality, each Sarah Polk Coin is minted from 1/2 ounce of .9999 fine gold. The Mint also produced proof quality Sarah Polk Coins. 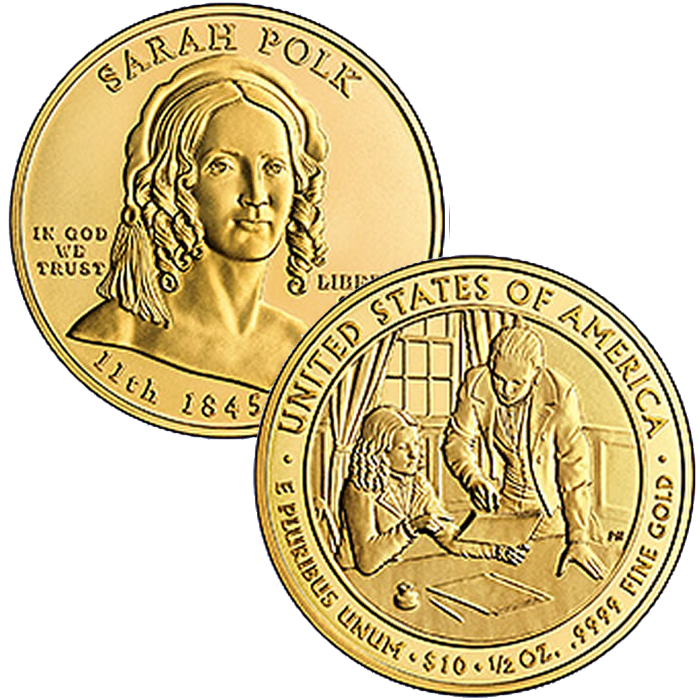 The US Mint released the Sarah Polk coins on September 3, 2009. Initial price on the Sarah Polk Uncirculated Coin was $641. Each Sarah Polk coin was struck at the US Mint’s facility in West Point and feature the "W" mintmark. The portrait of Sarah Polk on the obverse (heads side) of her coin was designed and sculpted by Phebe Hemphill. Phebe Hemphill also designed and sculpted the reverse (tails side) of the coin to show Sarah working beside her husband President James Polk in the White House.